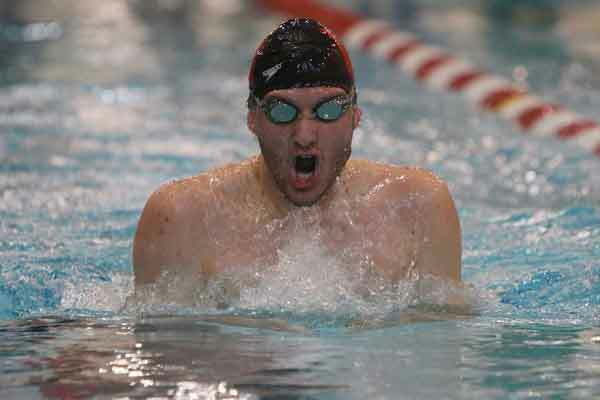 Freshman swimmer David Phillips continued his outstanding first year at Wabash by nearly setting a new school record Thursday night in the opening session of the Calvin Winter Invitational. Phillips (left) finished third in the 1650-yard freestyle with a time of 16:33.99, just over a second off of Elijah Sanders' school record of 16:32.35 set at the 2008 North Coast Athletic Conference Championship meet. Logan Rice also competed in the mile swim, finishing tenth with a time of 17:26.84, while Adam Barnes was 11th (17:28.68). Chad Woods finished 15th (17:40.02), and Logan Falley was 17th (17:59.31). Wabash took tenth place in the 800-yard free relay. Woods, Alex Beck, Rice, and Phillips completed the race in 7:23.21. Jacob Alter, Will Cheng, Barnes, and Falley also competed as a team in the race, finishing 11th with a time of 7:33.74. The Invitational continues Friday and Saturday with preliminary events beginning at 10 a.m. and finals scheduled for 6 p.m.